Do I get out now? I had bt infinity installed on tuesday, and the speeds have been ok so far, bit varied. But today has been dire and worse than the speeds I had on o2. I'm still within my rights to cancel, so do I get out while I can? Re: Do I get out now? The speed is more or less the same via other speedtests and I'm getting the same result via nzb downloads too. this does not look right. you have a high sync, but poor actual download speed over the link.. Your upload looks ok. I would report this as fault. Already have, It was ok when they installed it, I think it's a case of BT not having enough bandwidth in my area, if that's the case I will cancel it and get FTTC from another provider. I would check your phone line for "noise" and then if there are clicks etc, report this as a phone problem. As others have said moving provider to another FTTC provider using the same BT network will not be any different. I also wonder if the BT VDSL box is actually faulty. Was the download tested by the installation engineer? Certain sporting events might be contributing to a general ownage of the internets today. Or there may be some sort of localised problem in your area that should clear. The connection from me to the Cab and back to the exchange is provided by BT open-reach, which isn't causing the problem here, It the bandwidth supplied by BT retail which is. Anyway the problem seems to have eased, as people has stated recent sporting events may of tipped the network over the edge. 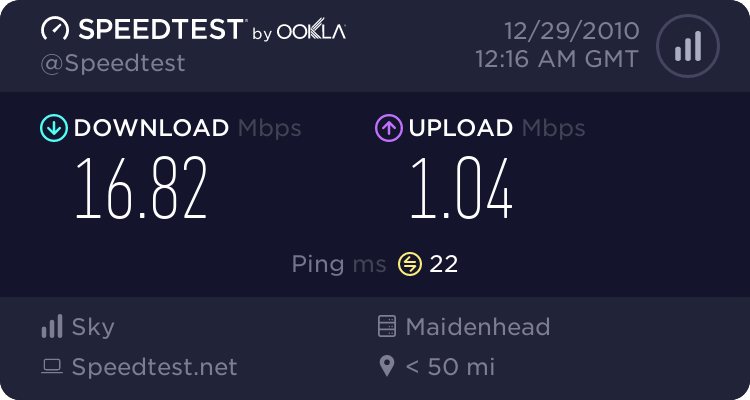 I will give BT benefit of the doubt here, I don't mind slow downs, after all I'm on a contended service, but I don't really want slow downs to this extreme where it's worse than my previous provider every time it gets busy. Shame . That previous signature spelling was so appropriate to your question. Just wait till the Olympics! Newnet hardly noticed them (well, throughput dropped sometimes to 40% of profile but nothing really serious, when even IDNet and Zen were getting complaints here about 500Kbps). I don't remember the BT reports.